Many people feel that Chaat is junk food but I do not fully agree with this thought. The puris & the sev used is deep fried but the chutneys & the fillings used are healthy as it is free from cooking oil. It also has fibre, vitamins, proteins.The ingredients used in the various chutneys are valued in Ayurveda & helps in bringing about a balance in vata, pitta & kapha. Just a dash of this sweet-tart chutney, spread over chaat raises the flavor by leaps & bounds. This zesty & tangy dip adds a new dimension to any fried Indian snacks & oomph to your meal too. Clean & wash dates & tamarind. In a deep pan boil dates, tamarind & jaggery in one litre of water for about 5mins. Strain the water & reserve for further use. Let the residue cool & then discard stones & seeds from the dates & tamarind. Put the dates, tamarind & one cup of the strained mixture & in the mixie & blend till smooth. Strain again to separate fibres. Mix the smooth puree along with the remaining reserved liquid in a deep pan. Sieve the ground spice fine powder & add to the tamarind puree along with rock salt, saunth, fresh ginger paste & salt. Stir well. Bring to a boil & let it simmer for about 10 mins. or until the chutney thickens a little. 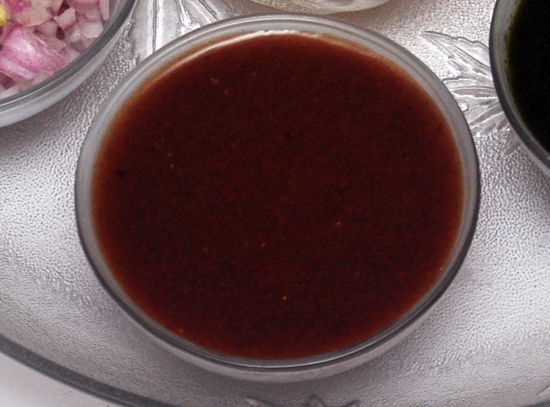 Cool thoroughly to get thick sweet tamarind chutney/meethi imli chutney. 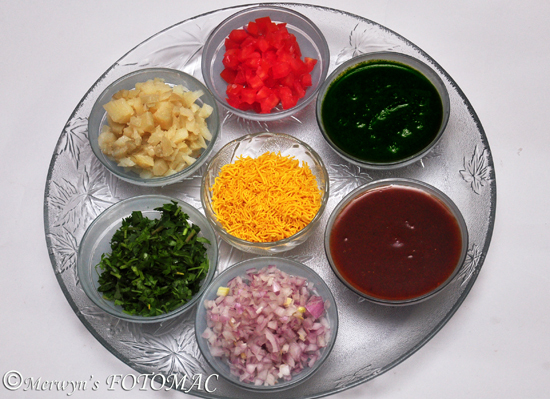 Use to prepare various chaats or as a dip. The fresh herbs used brings in a lot of freshness to the chaat. Ayurveda emphasizes the medicinal value of mint & coriander in daily healthy cooking. This chutney is zesty & adds punch in your chaat. Pick coriander & mint leaves. If the coriander is tender, retain stems & discard roots. Wash both the leaves thoroughly. Lightly scrape the ginger; chop roughly. Discard stems & seeds if you like it less spicy. You may reduce the number of chillies if you like it low on spice. 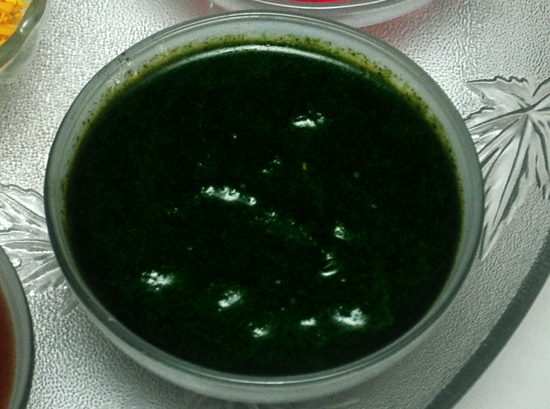 Grind together all the above green chutney ingredients to a thick & smooth paste. Garlic aids digestion & has innumerable medicinal qualities. This chutney is for all those who love & enjoy the flavor of garlic. For this chutney, peel & keep ready cloves of 3 medium garlic pods. Add about 20 red dry chillies with seeds & stems removed. Mix in one & a half cups of water soak till chillies soften & grind to a smooth paste. Add more water to dilute if required & salt to taste. tasty chutneys are the key for yummy chaat.. liked ur recipe for tamarind chutney.. am going to try this!